The Legal Practice Management Software Market research report provides an overview of the current market Trend, incremental revenue, and future outlook of the Legal Practice Management Software market. Pune, India - August 10, 2018 /MarketersMedia/ — This report studies the Legal (or Law) Practice Management Software market, Legal practice management software is software designed to manage a law firm's case and client records, billing and bookkeeping, schedules and appointments, deadlines, computer files and to facilitate any compliance requirements such as with document retention policies, courts' electronic filing systems, etc. The Global Legal Practice Management Software Market research 2018 highlights the major details and provides in-depth analysis of the market along with the future growth and prospects. The reports also offer important insights which help the industry experts, product managers, CEOs, and business executives to draft their policies on various parameters including expansion, acquisition, and new product launch as well as analyzing and understanding the market trends and demands analysis explore with the help of 15 Chapters, complete report with 136 Pages, figures, graphs and table of contents to analyze the situations of global Legal Practice Management Software market and Assessment to 2023. The report provides the customers thorough coverage of the Legal Practice Management Software industry performance over the last 5 years, and an accurate estimation of the market performance substantiated by the observed market trends over the years. Legal practice management software is a type of tools to law practice management activities. And the Legal practice management software can be classified to cloud-based and on-promise type, and the cloud-based type is leading the growing market at present. Legal practice management software is mainly used for three applications: law firms & attorneys, courts, other users. And law firms & attorneys was the most widely used area which took up about 74% of the global total in 2017. The global Legal practice management software average pricing is influenced by the global trend because of competition and downstream cost controlling. The average price will be in decline trend if more vendors go into operation in the future. The Legal practice management software sales will reach about 1047 Million USD in 2017 from 491 Million USD in 2013 all around the world. The global Legal Practice Management Software market is valued at 1050 million USD in 2017 and is expected to reach 2330 million USD by the end of 2023, growing at a CAGR of 14.3% between 2017 and 2023. North America, especially The United States, will still play an important role which cannot be ignored. Any changes from United States might affect the development trend of Legal Practice Management Software. The Legal Practice Management Software industry report has an in-depth coverage of the market along with multiple segmentations of the Legal Practice Management Software such as by type, application, and region among others. The report further covers the detailed analysis substantiated with suitable statistics of the factors, opportunities, challenges, and prospects for the players in the Legal Practice Management Software. Moreover, the report covers all the top players in the Legal Practice Management Software which is inclusive of a detailed company profile, the products on offer, and revenue and market share of each player. There are 15 Chapters to deeply display the Global Legal Practice Management Software market. 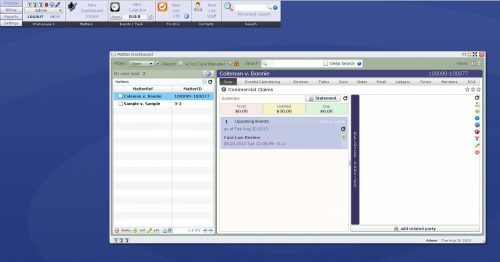 Chapter 12: Legal Practice Management Software market forecast, by regions, type and application, with sales and revenue, from 2018 to 2023, Chapter 13, 14 and 15: to describe Legal Practice Management Software sales channel, distributors, traders, dealers, Research Findings and Conclusion, appendix and data source. Asia-Pacific Legal Practice Management Software by Countries and more……….